E-Mail Deliverability Analytics – Junk or Inbox? Our ASoS Inbox Monitor Tool knows the answer! What was your last campaigns performance like? Does your inbox rate drop? Are your emails filtered? If so, why? 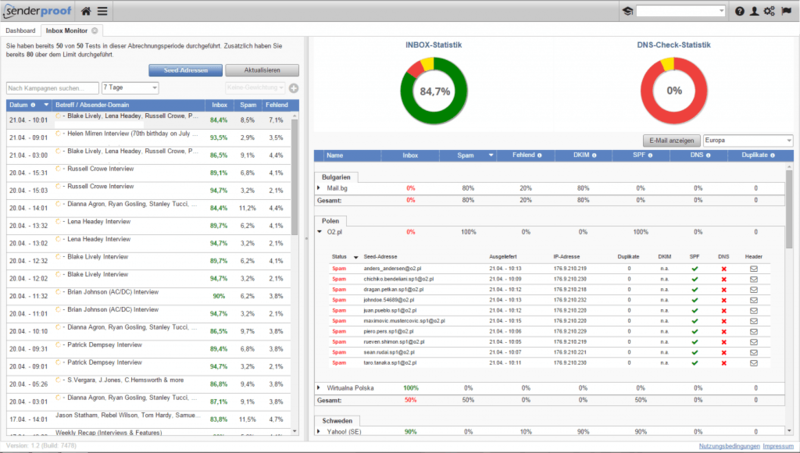 The Acoonia Software Suite (ASoS) – Inbox Monitor depicts deliverability issues by provider. Detailed information about delivery time, sending IP address, ISP-Filter results, DKIM and SPF provide you with the basis for fast trouble-shooting. A seedlist based technology is used to calculate a statistical projection for all your email campaigns inbox rates. But heads up! Receiving domains are not the same for all target groups. Target groups of companies with German email recipients contain addresses of the providers web.de, GMX and t-online.de for the most part. North-American companies’ target groups on the other hand mainly contain addresses of the providers gmail, hotmail, yahoo, outlook.com and aol. The ASoS Inbox Monitoring Tool enables you to represent this spread using weighting. This way the inbox data calculated by ASoS is as accurate as possible. As we are a German based company with more than services we could you provide with deep insights about european ISP deliverablity beyond the existing postmaster tools. We concentrate our services for european and north american markets and helped customers around the world to increase deliverablity rates for their campaigns.